I’m not normally one to try to photograph birds—I have neither the expertise nor the long lenses that are generally required for good bird photographs. 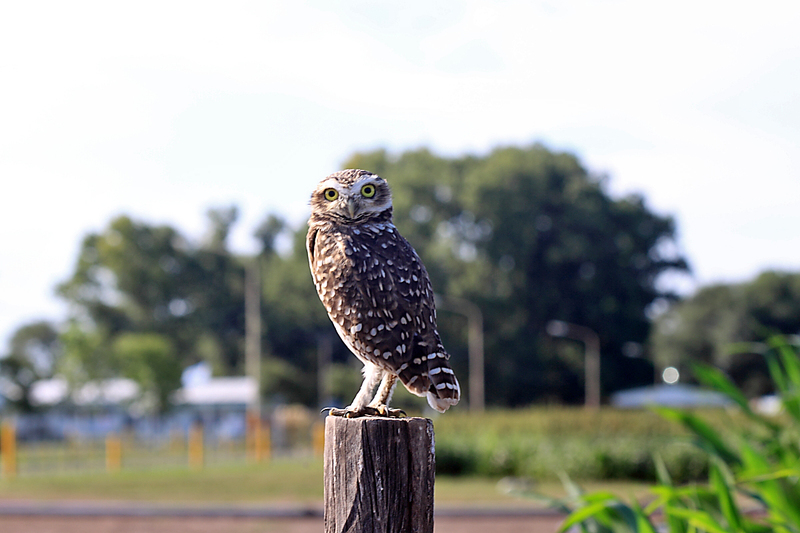 However, during my March trip to Argentina I scared up this burrowing owl (Athene cunicularia), who flew a short distance, landed on a nearby fence post, and then just sat there staring at me—almost as if it was daring me to try. Never one to turn down a challenge (real or perceived), I took the bait. My longest lens is a 100mm macro, so I set the camera to automatic mode, pointed it at the bird, and started walking. After each slow, deliberate step I clicked the shutter, racking up about a dozen shots by the time I took the photos below. They are minimally cropped only for composition and, thus, attest to how amazingly close the owl allowed me to get before it finally found the situation just too unsettling and flew much farther away. My colleagues commented afterwards that they wished they’d taken a video of me stalking the owl (which they found almost as amusing as the bird’s incredulous stare). Perhaps all the tiger beetle stalking I’ve done helped. 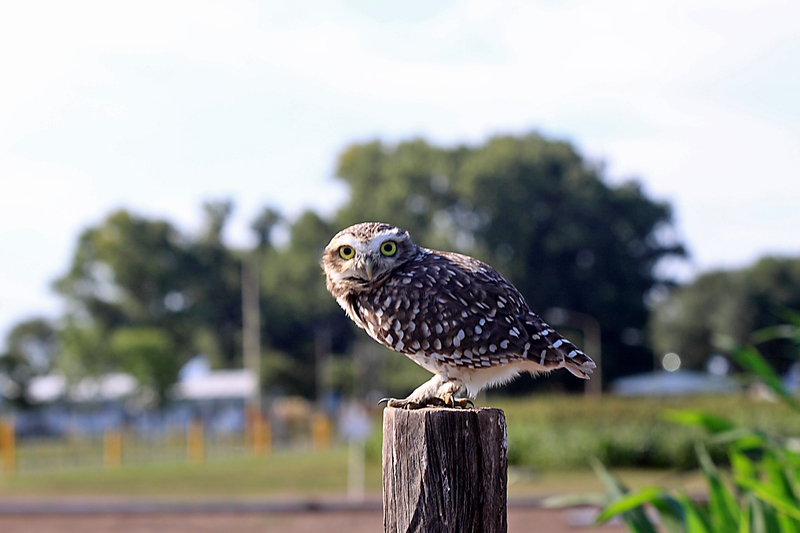 This entry was posted in Aves, Vertebrata and tagged Argentina, birds, nature, owls. Bookmark the permalink. Those owls are just my favorites. I have never seen them not be adorable, if you can parse that double negative. Thanks for sharing! Thanks BugGirl – I love the stare of those big yellow eyes! Wow, what WONderful birds. Beautiful, clear shots. SO envious. Thank you, BB! As close as I got, I still wish I could’ve gotten even closer. Very cool Ted! If you get tired with tiger beetles, I’d say you’ve got a future in owl stalking! Thanks, but I can’t imagine every getting tired of tiger beetles! I’ve seen a similar imprint of a red-tailed hawk. Unfortunately, the bird didn’t survive the window strike. Interesting – I’ve never seen anything like that. I wanted to agree with Bug Girl. 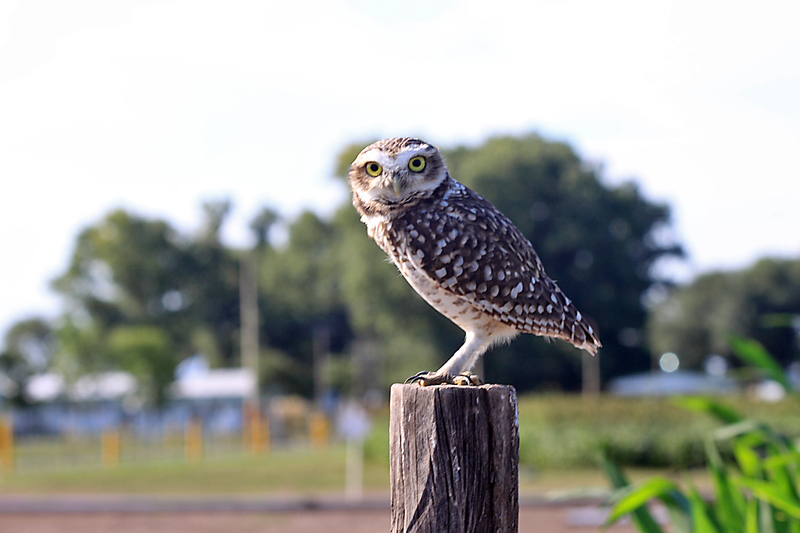 Burrowing Owls are amazing to watch, though I’ve never stalked one. They have occurred in Missouri on rare occasions. I saw a few in California but never got a really good look at them. It was amazing to see this one so close. Great post, I just love these cute owls. I would love to see them in person someday! Coming to this post many years after you shared it, but wanted to say thank you for naming the owl species for me. In 2000, I was down in Pinamar, Argentina. Lived there for a couple of months and I noticed one of these little burrow owls in the dunes a few blocks from my place. I would often pass by while running errands just to watch. One day, it was much as you described – he got agitated that I was watching and went and landed on a power poll nearby. It was then that I noticed a second head, just inside the burrow and realized they were a mated pair. I stood and watched for a while, maybe 2 minutes. The male was screeching at me. Finally I decided I’d bothered them enough and turned to go, when out of the corner of my eye I saw a shadow and a small feathery body slammed into my head. He raked my scalp with his talons and knocked my sunglasses askew before gliding off to the top of the dune to screech at me some more. I was stunned, amazed at the nerve of the thing. He even drew blood. A week later I passed by and there on the ground right outside the entrance were two little puff-balls – the chicks the female had been guarding. Such a bold little bird, he’d been protecting his brood and attacked an animal (me) 100 times his size or more. He had my immediate respect. Such cool little birds. Great shots of them.